If you could sum up A Gentleman in Moscow in three words, what would they be? This book was lovely. No violence, no horror with a slower pace for life. Count Rostov and all of the characters left an indelible mark in my heart. Story takes place during a tumultuous change in Russia resulting from the backlash of the unrepentant, greedy aristocrats. Although Count Rostov is part of this era, he is the better part. The story reveals the Count's gracefully transition from an elegant life to house arrest at the Metropol Hotel. The characters are priceless and clearly show the pettiness of comunism (who reminded me of busy now-it-alls). The narration was so very very good. This book does a wonderful job of transporting you into another realm! The characters. I also liked how a chapter would start with information that did not come together until the end of that section. At first it frustrated me, but after several times I became excited to learn the outcome. BTW, the end did surprise me. Have you listened to any of Nicholas Guy Smith’s other performances before? How does this one compare? No never read to Smith's other books. I did sampled several other books he narrated, but the story line of those books were not interesting to me. Yes. It was charming in an anticipated fashion. It made me sad to finish the book and made it tough to find another book to read. It took over one week to find an equivalent because both the story and the narrator had big shoes to fill. 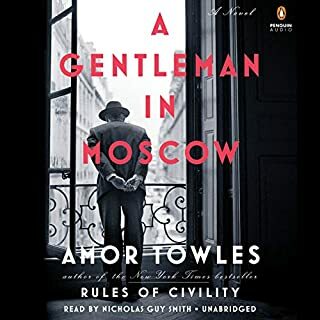 I sampled Towles other book, Rules of Civility and I think it was a very big mistake to use Rebecca Lowman, her voice did not transport me. This may be the reason for the 4.2 vs 4.6 rating. I will give it a try reading it on my Kindle.